I never used to be a ‘morning’ person although living in a hot, tropical climate I find the cool, early mornings are the best time to awake.. If I’m early I can usually catch the morning Thai food stall vendors selling to the workers on their way to factories. I didn’t realize how factory workers in Sounth East Asia were lucky enough to eat ‘dark purple sweet potato’ freshly baked in its skin on an open barbecue grill, for breakfast every morning. 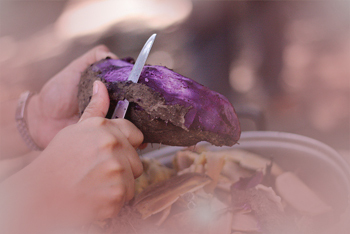 If you’ve ever tried this purple potato, you will know what I mean.. I can only describe this as the ultimate nutritional and delicious, sweet tasting, hunger filling, organic vegetable you could ever want. I would never have guessed the reason why.. The nutritional values of this particular sweet potato are remarkable!– everything you’d need to feel full, enjoy taste and to give you the minerals, vitamins and proteins you need to nourish your body, feel energized and basically achieve your goals for the day..
..AND without feeling hungry, lethargic, bloated or any of the other signs that neglecting your own personal health can have– and all for the cost of just pennies! Feeling tired, being short on time or lacking energy– is not your fault! It’s easy to over-look your ‘own’ personal health and I can’t blame you for that. Besides, it’s often the last thing on most people’s mind. I mean there are other things in daily life that demand your time, energy and attention, right? Here’s just a few things to mention..
and IF you’re lucky enough to have the time and energy left over..
All these things eat up the best part of your time, effort and energy. It’s not selfish to put your own health first, here’s why..
What if by improving your own health you could focus more time and energy on all the things I just mentioned above AND have more time, energy and attention left over to do more of the above including other things you enjoy in life. When you DO put your own health first, you’re more able to achieve all these things AND have more time, be more efficient, increase brain function and alertness, allowing you to focus more, get more things done AND actually enjoy the process because your energized. Your bodies ability to function at its optimum level allows you to do all these things like..
All these things you can achieve and enjoy when you put your own health first. I previously mentioned that to manage healthy body weight, improve your skin and body functions, improve your general health, longevity and age youthfully, the first not-so-obvious place to focus your good health mission is your liver health. For instance, detoxing your liver is the equivalent of cleaning out toxins, poisons and replacing your body’s filtration system. Although detoxing your liver alone won’t have the immediate energy boosting, fresh feeling, life inducing impact your body is crying out for (even if you don’t know it)..